← Speaking gig at NIDA – Panel members required! Ben Quilty is one of Australia’s most talented and respected young artists of his generation. 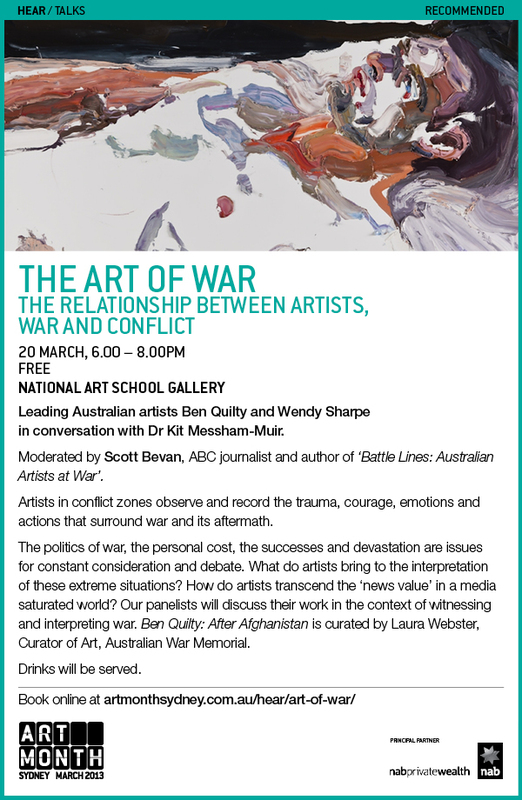 In 2011 Ben travelled to Afghanistan as the Australian War Memorial’s official war artist. This exhibition features new work made from this experience and the close relationship he formed with his subjects. Having met Ben through our mutual desire to help The Bali Nine get off death row, I was only too happy to film the Launch of his new exhibiton. National Art School Sydney until 13 April then touring nationally to 8 venues over 2 years. Dear Nick, it’s very impressive. Thank you very much for making this video and for sharing it with us. Thanks for this – it’s amazing! So great that you could capture such a special night for us all – especially Ben! Danielle Neely, National Art School. Sophia Stacey Bought tears to my eyes. Beautiful work. Michael Daly Gee, that’s good. How eloquently both the fimmaker and John Oddie express themselves. Great show by the way. As we left, my 4 year old said “it’s very thick”. Took us a while to click that he was referring to the paint. Graham Murgatroyd Wonderful short video, will see them over Easter. Robert Rosenberg Awesome, really well painted, filmed, edited and spoken. Loved it. Michelle Henry Beautifully filmed and with very profound words. Can’t wait to see the work when they come to Brisbane next year. Filmed on the Canon C300. Thanks to Madeleine Hetherton, Rebecca Barry and Ester Harding at mediastockade.com for the camera and support.